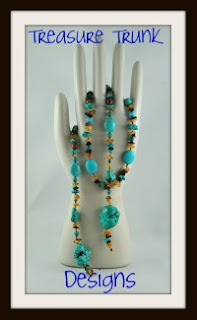 Your Etsy Shop Should Be Visible on Your Blog or Website. Sometimes, it’s the simple things we overlook. I’m here today to tell you how important it is when doing your social networking, to have proper placement of your Etsy shop on your blog or web. I am not even joking here when I say this is a real issue in one of three blogs or sites. As I am involved in several Etsy teams and come in contact with thousands of members per day, I cannot tell you how many people ask me to look at their blog or web and wonder why it’s not driving traffic to their store. Sometimes, we’ll be talking about Google Analytics and they say, “Well Google says I get no traffic from my blog.” So , I pull up their blog, and I can’t believe my eyes. Here I will discuss examples of what I’m talking about, (these are real blogs, that I read, and names have been whited-out to protect the unknowing!) I will show you proof that what I’m saying is true. I will then tell you how to fix it, if you fall into one of the two categories below. No Link to Etsy Shop on an Etsy Seller’s Blog. This blog has great content, however, this is an Etsy seller and has nothing to drive you to the Etsy shop. As soon as I finish this, I’m contacting her as I’ve made her an avatar to put smack dab onto the top of her blog. Link to Etsy Shop Is Not “Above the Bar”, meaning you have to scroll to find it. The Etsy Seller has a beautiful blog, and is making great use of the follow her on Twitter button, but what of the Etsy Mini? I had to scroll down to see it. It’s not at first glance, above the bar. In other words, I’m always reading her TOP POSTS. So, why would I scroll down and read something I’ve already read, which means, I probably wouldn’t notice it. Are you suffering from Placement Poverty? 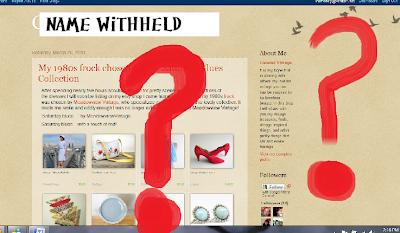 Your blog or web should have a nice avatar going direct to your Etsy shop. Furthermore, this should be one of the first things you see when you pull up the site or blog. Remember, it’s the window you first see when you first pull up the screen — the top of your computer page or above the bar. You don’t want to “scroll down” the blog to find your avatar. Especially if someone is checking your top posts, or visiting your blog frequently, they may only read the first post or so. Here are examples of primo placement. 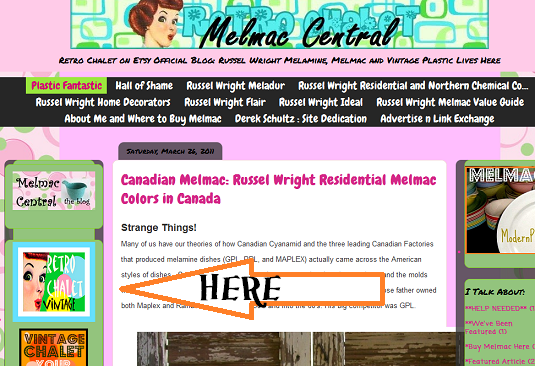 Primo Placement Position #1 : Next to the Blog Post Title. Shameless promotion, maybe, but my store is the first thing you see onmy one blog that features other Etsy vintage sellers. Why not? I’m the top sponsor if it’s my own blog, and doing all the work, right? When you read the headline you also see my shop. Very cool placement. Primo Placement Position #2 : Next to the Start of your Post. Now, I’m second down on this blog, and moved from my right hand position. On the right is a paid advertiser, so I decided that the best placement for me is to be right where your eyes start to read the post. The choice of colors for my avatar “pop” out from this page don’t you think? I could go on and on, but you can do this simple math by looking up the blogs you subscribe to. 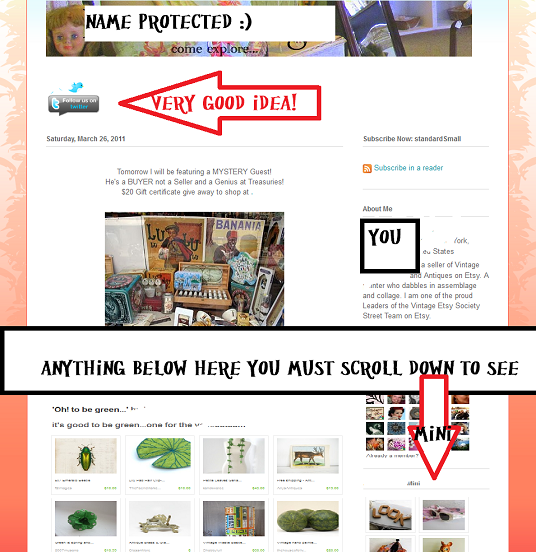 Upon visiting the page, how many actually have links, avatars, or products pointing right to their Etsy shop above the bar, on your screen staring you in the face? Do you have to scroll to find it? If this is you, do something now! If it’s your friend, send them this article, quick! Show them the PROOF of what I’m saying is true! Here is my 2nd blog above, where I actually have lower placement. It is solely responsible for driving 35 new visits to my shop last month, and those people spent an average of 6 minutes and 46 seconds looking at my Etsy shop. Each one looked at approximately 4.86 pages per visit. It appears I am my own source of traffic! 1. 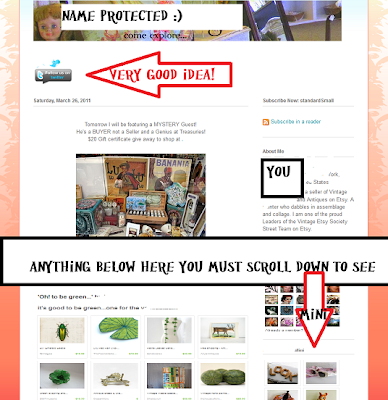 An Avatar: Quick and Easy Link to Your Etsy Shop! These were all made with either basic programs like Paint, or Picnik, which is free to use. They don’t have to be fancy , but should peak your curiousity! Most were used by using Etsy photos, and adding text and a frame in Picnik. What’s not to love, 5 minutes later, you are on your way to the perfect shop avatar. Add them as a Picture and link them to your Etsy shop. So quick, and so easy, and FREE. 2. Use the Etsy Mini! 3. Use the Pocket Shop! Here is an example of a pocket shop (and these are great because you can choose different skins to match your blog.) This one is going to highlight Etsy seller BarSoap’s shop. You can either highlight everything in the shop, or only “one section” of your shop, for instance, if you have an overstock in earrings leftover from that last craft show and you are dying to unload them. Available at CraftCult. Tip on Scripts: I personally like the picture avatars because “scripts” can sometimes slow up your blog load times. If you use the “Search this Blog” by Google, that is one script. A pocket shop would be a second script. Too many scripts, and your page load time decreases. Choose what is best for you and your blog. Then use your analytics and compare the month after you made the change. You should see improvement! Please come back to this post and comment here and tell me how it worked for you! If you want to thank me for this basic enlightenment, tell people about my new blog, which is all about vintage on Etsy here. You May Also Like: Tim’s Post Using Google Analytics. I just realized something. I have the Etsy mini on my blog. And in my links gadget I have a link to my Etsy shop. Never realized I had it on there twice. Good or bad? Not sure. I’ll have to think on it:) Thanks for posting. Guilty as charged! My link was where anyone would have to scroll to see it. Hard for me to toot my own horn. Moved it to be at the top right. Thanks for this article. Great write up. I’m gonna have to check out my blog and see if I am committing any of these faux pas. I was always debating between using an etsy mini or the pocket shop on my blog. Will stick to what I still have on my blog the pocket shop! Great post, I pulled up my blog and did a play by play comparison. Thanks for giving me some new things to think about. Another thing I’ve noticed people over look on their blogs is making contact info easily accessible. I recommend adding widgets or links to your social media outlets (fb, twitter, etc) but also include your email address or a simple contact form! Thanks so much! I’m SO new to this; each piece is a hurdle! 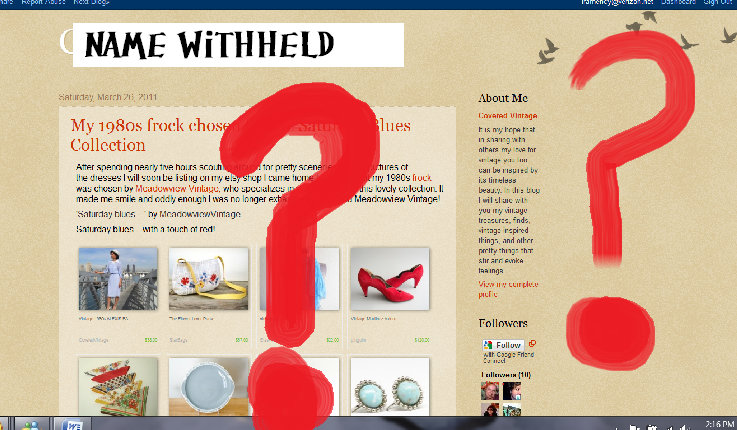 As yet, I can’t figure out how to get anything added to my blog, with the exception of new entries and the banner. I keep reading & taking notes……..then try some new little piece of info, but so far, I’m not having much success. Wow! I never thought about that! Thanks! Glad I stopped by and read the comments too. Excellent pointer. I have it right! My Etsy shop button is the first thing you see. Yeah me! Im learning. I meant to say Thank You much earlier today, but you’ll understand how sincerely I mean it when I say I’ve been reworking my blog – all because of your wonderful article. So … late but from the heart – THANK YOU!!! Thanks for all this information…..off to check my blog! Great tip! I have this on my blog too! This was awesome! I JUST started trying to figure all this stuff out and this is very helpful. Going to go do the mini etsy right now! Thank You! For example, in the Google search box you would enter link: http://www.etsy.com/shop/forgetmenotkeepsake and Google will list all the sites that link to your shop (including your blog, facebook, internal links, etc). If you have a lot of links, it will not show you all of them unless you go to the bottom of the list and click on “repeat the search with the omitted results included.” Hope this helps. why this twist of fate did not happened in advance! Good information! Do you have any topic on “no follow” links? I was just thinking recently if I need to make a “no follow” link to every item from Etsy shop that I mention on my Blog. I am sorry for this question, but I just do not really understand “no follow” links, if they are only for affiliate.